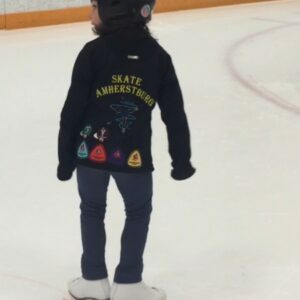 What should my child wear to skating? We recommend that you dress your child in layers to keep warm. We do not recommend snow pants as they can be very slippery on the ice and can make it difficult for skaters to get up. The same goes for knee pads. Elbow pads are generally unnecessary and can restrict movement. We do not recommend any hockey equipment (aside from helmets) such as shorts or gloves. The bulky gloves make it difficult for the skaters to pick up toys and other teaching aids. Parents should ensure that skaters with long hair have it out of their face, especially if their helmet has a face mask. Skaters should also wear gloves or mittens. There is a certain type of fuzzy mitten that sticks to the ice and leaves fuzz behind. This can be a hazard to the skaters if they skate over it. Please try to avoid these types of mittens.